Will Chelsea strengthen in the January transfer window? We look at potential ins and outs and consider what key positions need filling. With Chelsea's early-season title challenge tailing off in the second half of the season, what promised to be a positive maiden campaign in the Premier League for Maurizio Sarri is quickly turning into a battle for the top four. Saturday's defeat at Arsenal left Chelsea just three points clear of the Gunners and Manchester United, with the Italian dressing his squad down afterwards as he accused them of being difficult to motivate. With Gonzalo Higuain signed on loan, we look at who else Sarri could bring in to get Chelsea's season back on track, while Soccer Saturday pundit Paul Merson offers his assessment of the state of the squad at Stamford Bridge. With the misfiring Alvaro Morata and far from prolific Olivier Giroud registering just six Premier League goals between them this season - four less than Eden Hazard - it was not a surprise to see Chelsea in the market for a striker. 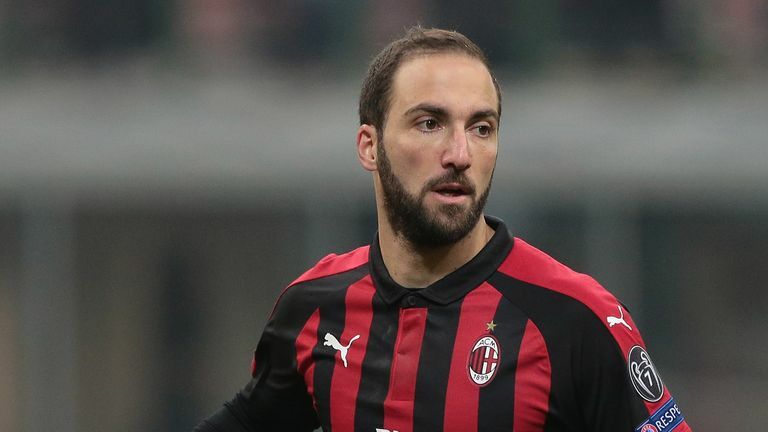 One of the most lethal front men in Europe in recent years, Higuain has joined Chelsea on loan for the rest of the season. Chelsea might also look to replace Cesc Fabregas after he left to join Monaco. Higuain's arrival will pave the way for the departure of Morata. The Spaniard's loan move to Atletico Madrid is expected to be completed soon. Another player who could follow Morata out of the door is Callum Hudson-Odoi. The 18-year-old is understood to have rejected Chelsea's offer of a new £85,000-a-week deal as he continues to push for a move to Bayern Munich. Bayern have made no more than four bids for Hudson-Odoi, matching Chelsea's £35m valuation, and the player has made it clear he does not want to extend his contract at Stamford Bridge. If Chelsea are open to letting Morata leave and would prefer to see Hudson-Odoi stay, then Eden Hazard is a player they are not even contemplating losing. The Belgium international has flirted with the idea of joining Real Madrid in the future, having admitted he wanted to leave Chelsea last summer. However, with any departure unlikely to take place in January, there is no immediate concern for Chelsea. Leandro Parades and Nicolo Barella have been mentioned as potential replacements for Fabregas while Chelsea are in talks for Victor Moses to move on loan to Fenerbahce. Forward-wise I think Chelsea are better with Giroud in the team. It's a big gamble, Higuain, the manager will die by his sword on that. If it doesn't work out, he's in trouble. I don't think upstairs they are happy about it, they're backing the manager and I think he's put all of his eggs in one basket. It's going to be a lot of money, he won't be on a youth training scheme wage. He's 31, nearly 32, he has been a good player and he and Sarri know each other, but it's another case like Jorginho, he knows him. It might work, he has been a great player but it's a big ask in a big league to come straight in and hit the ground running. You've got to have a bit more vision, when David Moyes bought Marouane Fellaini in at Manchester United, everyone went ballistic. Chelsea need a left-back, Marcos Alonso plays like a number 10 - he doesn't help at all. I think they also need a centre-half. David Luiz can go from a nine out of 10 to a two out of 10 within five minutes of the same game. He's that talented but he loses concentration. That's wrong. Chelsea will more than likely be the most active of the top six clubs in January. A deal to bring Christian Pulisic in from Borussia Dortmund was secured just hours into the opening of the window, while the club worked quickly to secure loans for Kasey Palmer, Lewis Baker and Josh Grant. Hazard: Why not Real Madrid? With a week to go until Deadline Day, expect more movement both to and from Stamford Bridge. Morata looks to be on his way back to Madrid, with Higuain already signed to replace him, while the battle for Hudson-Odoi's future looks set to rumble on.